I got this as a nursery plant about 3-4 years ago. I've been working on branching and keeping it cut back hard until this year, when I let it go in hopes it would bloom for me. 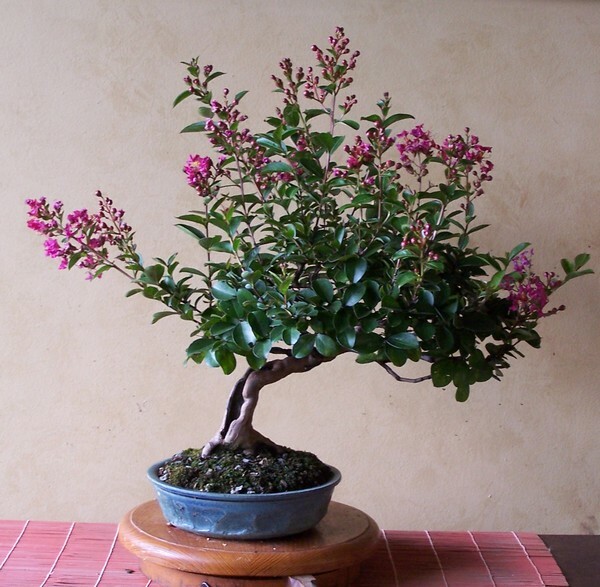 No such luck -- although other crape myrtle bonsai are blooming, and my yard plants were and are gorgeous this year. I cut it back this afternoon, for another year of working on branching. 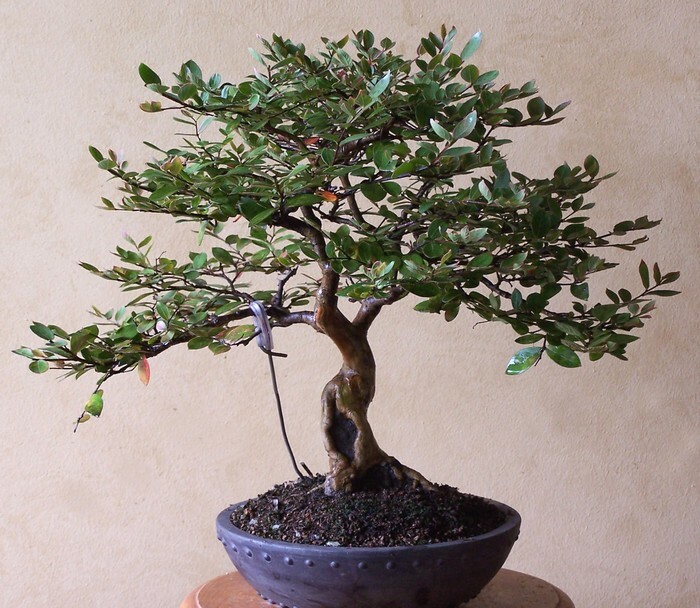 The branches look OK when it has leaves, but are a bit sparse when it is bare. This one stands 13 inches from the pot rim. The base is about 3 inches. I don't plan for it to get much larger. 'Acoma' has bark that is a brassy gold color. When it peels the new bark is a bright yellow. Fall color is bright orange-pink. 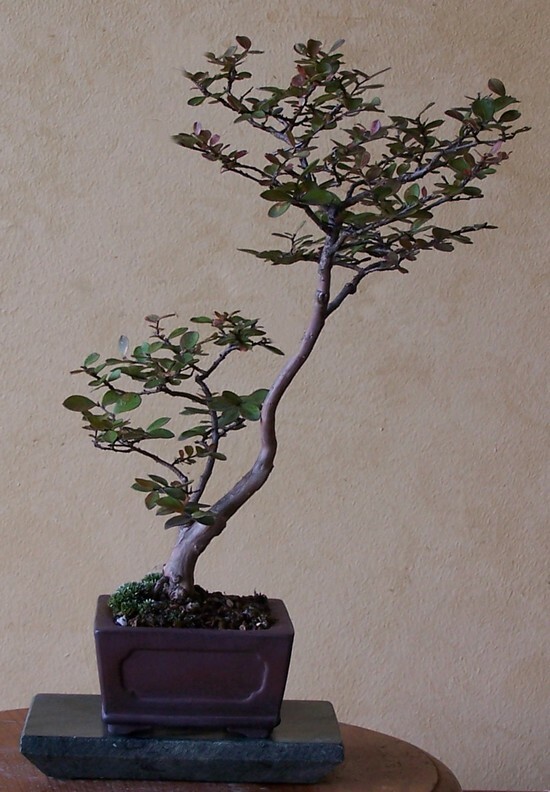 All in all it is a nice crape myrtle for bonsai, but I haven't seen it for sale anywhere but in Florida. Crape myrtles tend to bloom at the ends of branches. You may have to let the tree run loose to get it to bloom. That is one of the advantages of 'Chickasaw.' Mine has been in bloom since July while staying in show trim. Yes. Which is why I don't let them bloom too often. Here's a 'standard' crape myrtle with the ordinary fuchsia blooms that is still blooming here. I don't know how to keep mine from blooming. I don't want it to waste energy on blooms but I can't seem to stop it. I've meticulously taken the blooms off mine at least 4 times this year. I finally got sick of it (since it takes at least an hour to take all the flower buds off) and stopped bothering and it's blooming now again, to spite me I think. Maybe it's the variety. It's definitely not an "Acoma". It's some kind of standard red. Since I finally gave up and let it flower, the flowers are actually really close to the trunk. It kind of makes me think that eventually I might be able to keep the blooms in proportion with the branches. And by eventually I mean in at least 15 years, since mine is in EXTREMELY early stages of development. Good luck. I really like your tree and trunk line. I'll defer to others on the pot. Are you going to Asheville this year? Thanks. I had a real small crape myrtle that insisted on blooming after it had been cut back. It only did that once, through. I guess trees have minds of their own. I'm completely new to this so can't add anything. I just want to tell you how pretty your tree is, blooming or not. It's so graceful. At Bill Valavanis's over the weekend one of the Dazzle varieties he had there was still in bloom and these flowers were not up on stalks or long extensions but were sitting right up on the top of the canopy, so I'm wondering if there certainly are cultivar flowering differences with each kind wanting more or less new growth extension before flowering begins. drgonzo wrote: I'm wondering if there certainly are cultivar flowering differences with each kind wanting more or less new growth extension before flowering begins. Definitely. The newer cultivars, such as 'Chickasaw,' are hybrids between L. indica and other species, which affects their blooming as well as other characteristics. among them, apparently, cold hardiness. This one (variety unknown) has pale pink flowers that grow close to the plant. But on this one (the pot is only 3 inches wide) that still gives a fairly unruly look. It did not bloom this year, either. (The flowers are really too pale for my taste, so I don't mind when it doesn't bloom).